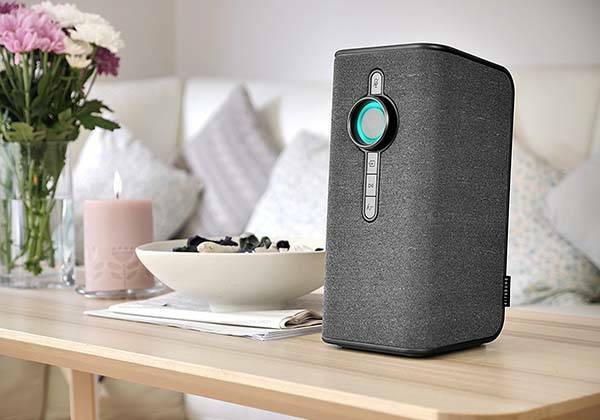 KitSound Voice One Alexa enabled smart speaker not only delivers room-filling stereo audio, but also brings lots of Alexa’s skills into your house. Like the idea? Let’s have a look. The Voice One is an Alexa enabled home speaker that measures 15.8 x 7.9 x 7.9 inches and weighs 4.41 pounds. Unlike the portable Alexa speaker, the Voice One has no built-in rechargeable battery, so it only fits in your house, and using up to 8 units, you can firm a more powerful home speaker system. As we can see from the images, the smart speaker shows off an elegant and stylish appearance design. The gray fabric wrapper blends well with any interior decoration style. 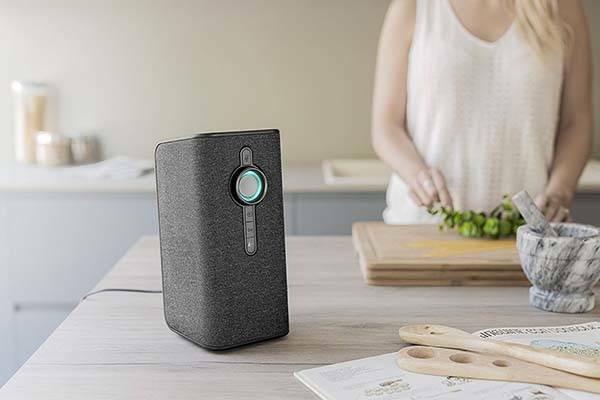 Meanwhile, its stain-resistant coating protects it from little splashes, so you can enjoy your favorite music or get cooking guides from the speaker during cooking in the kitchen. The Voice One comes equipped with dual speaker drivers and a toned bass chamber in order to produce clear, balanced stereo audio with decent bass. More importantly, built-in WiFi connectivity allows it to stay in your home wireless network, and it streams music from mainstreamed music platforms including Amazon Music, Apple Music, Spotify and more. Furthermore, built-in Amazon Alexa allows you to remotely control your music playback with your voice or ask it for checking the weather, reading news and more. Of course, it also interacts with other Alexa home smart devices such as the smart home robot. the smart robot vacuum cleaner, and more. The Voice One Alexa enabled smart speaker is priced at $179.99 USD. If you’re interested, jump to here for its more details.